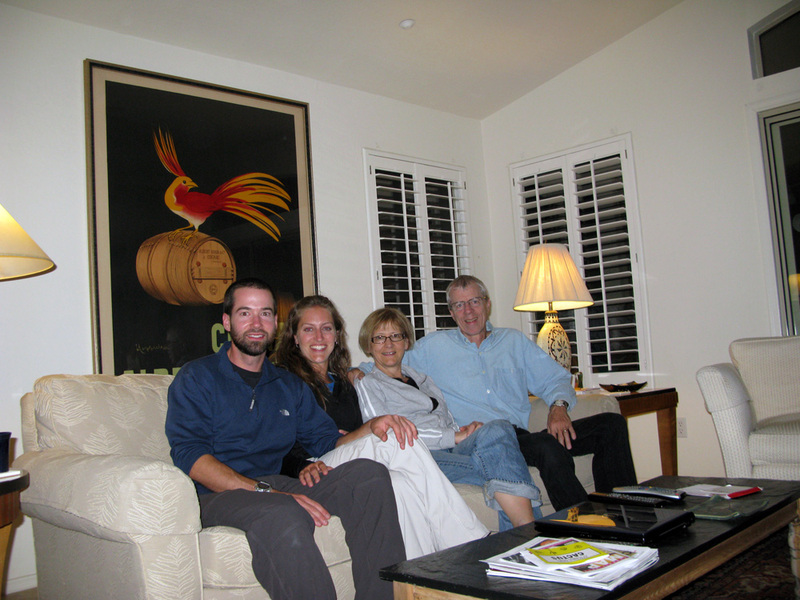 When we reached John and Julia’s place in Scottsdale (Pat’s aunt and uncle), we realized that our time in the US was quickly coming to an end. 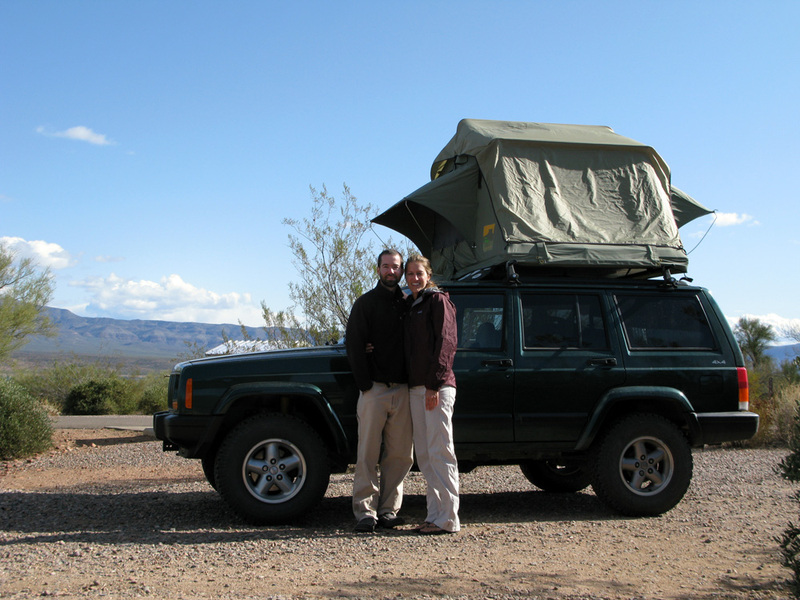 John and Julia generously offered to safeguard our Jeep in their driveway while we cross the border to poke around in Central and South America for a while. Consequently, this made Phoenix our official exit point out of the country. But we weren’t ready to call it quits yet and yearned for just a little more time with our comfortable and reliable Jeep, our luxurious tent, our bikes, and of course the freedom to just get in the car and drive. So after buying one way tickets to Costa Rica (yay! 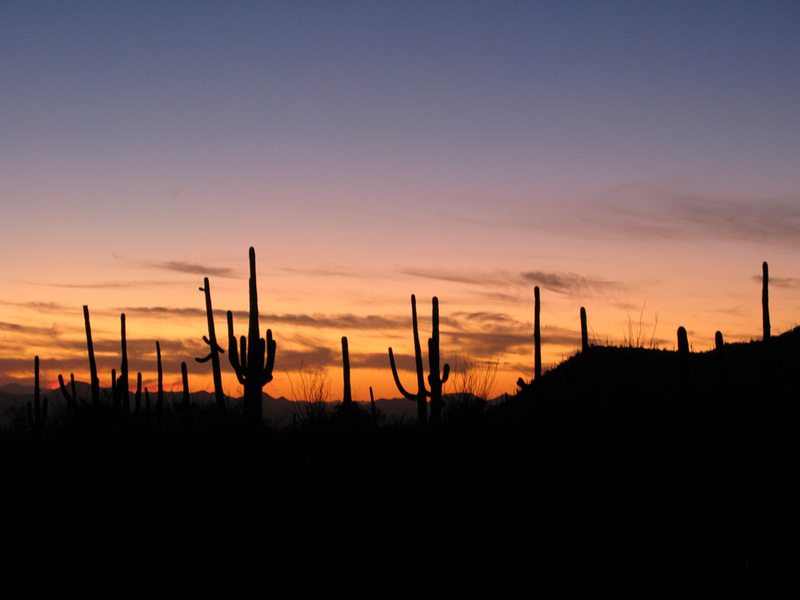 ), we got back in the car and took one final road trip to explore southern Arizona. This being our last week in the US, we were committed to saving as much money as possible and taking full advantage of our camping gear. So we went grocery shopping at Trader Joes and vowed not to eat out at all for the remainder of the trip and thus cook every meal on our two-burner stove (we almost made it – we bought lunch twice). Similarly, we were pleased to take advantage of our National Park pass one last time (we’ve been to 16 total – thanks Jim and Kathy!) 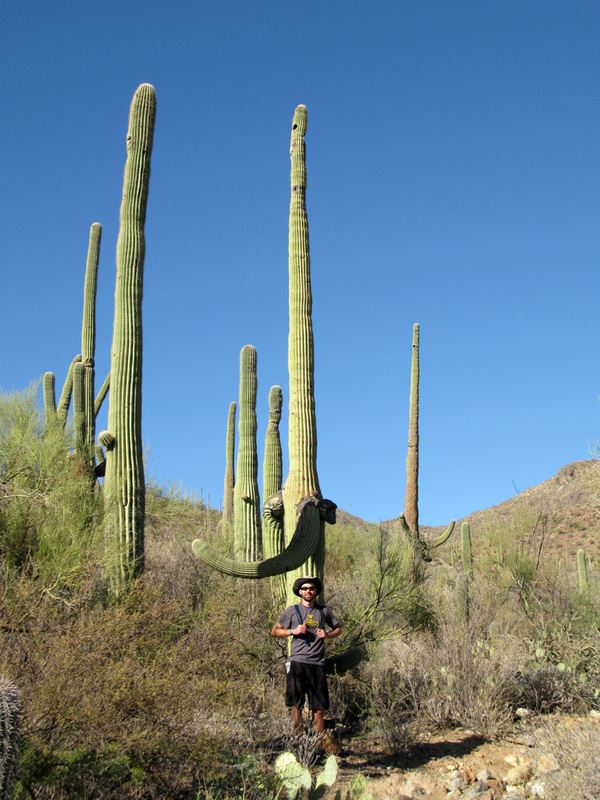 and visited the Saguaro (pronounced sa-WAH-ro) National Park on the west side of Tucson. 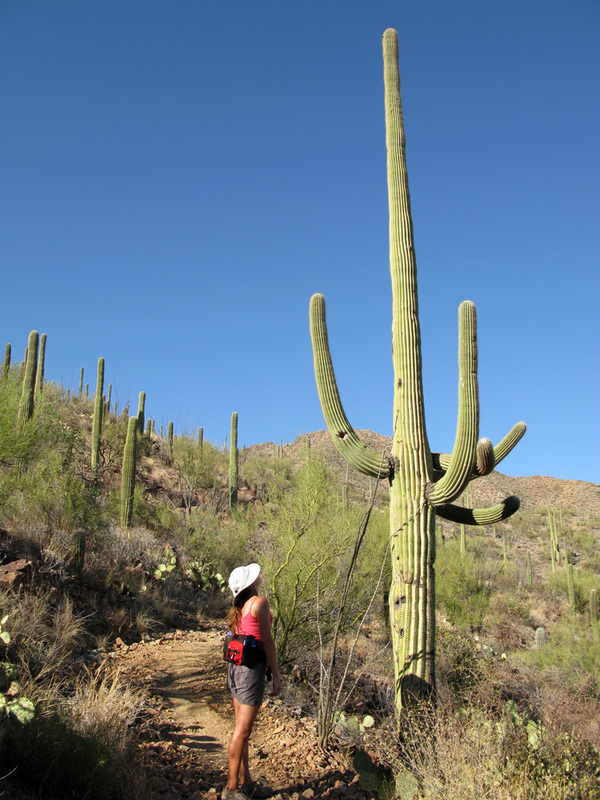 Picture the classic desert, multi-armed cactus – we were swimming in a forest of them! We had fun attributing personalities to each and estimating their age (some live to be 200 years old). 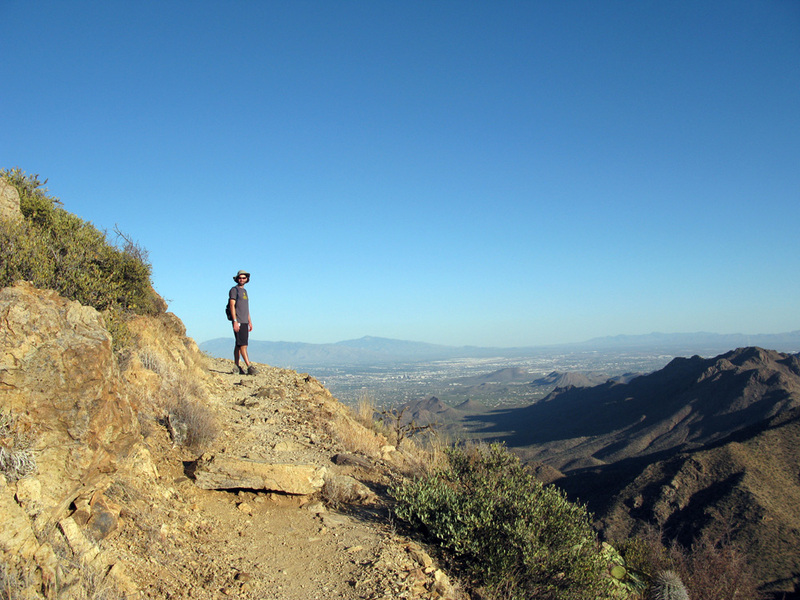 We followed the Wasso Peak trail, which provided 360 views of Tucson and its suburbs against a setting sun. We almost ran out of light coming down. That night we stayed at a nearby campground and cooked our second lamb steak dinner of the trip! 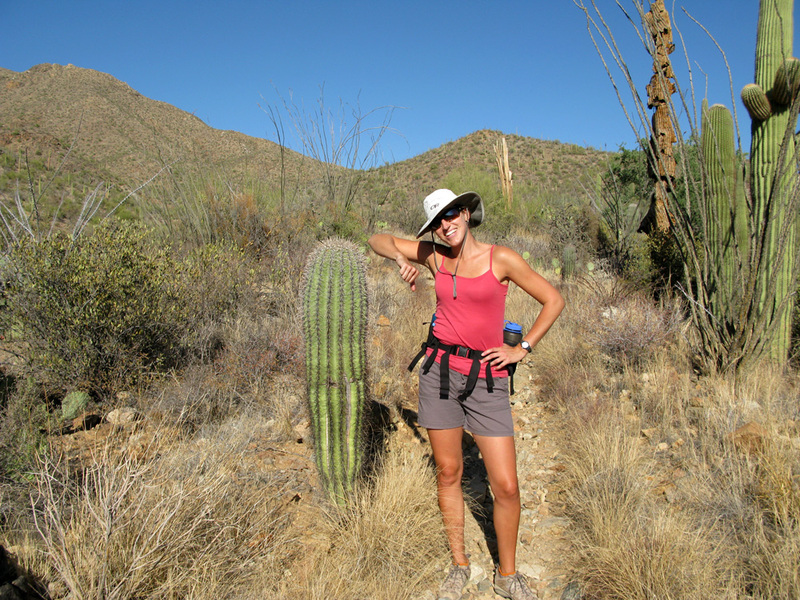 Caro's not afraid of no cactus! 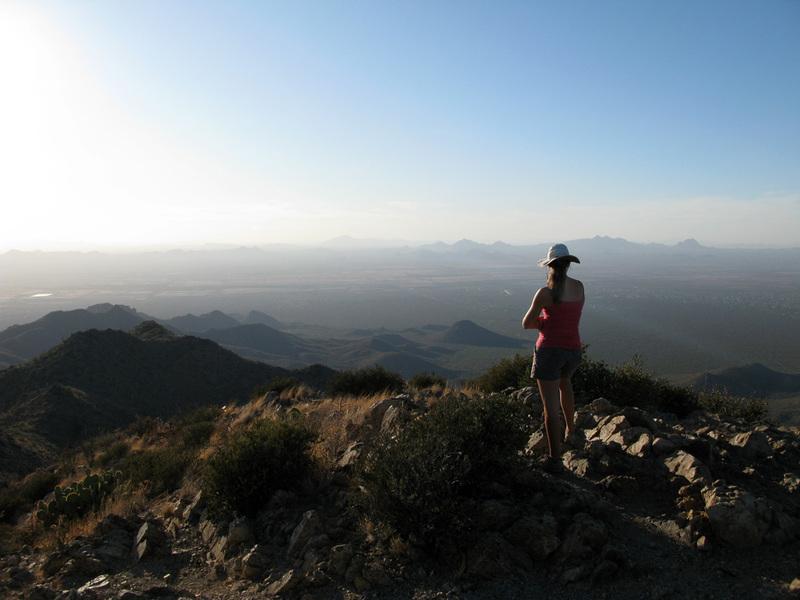 The trail up Wasso peak overlooks Tucson. View from the top just before sunset. 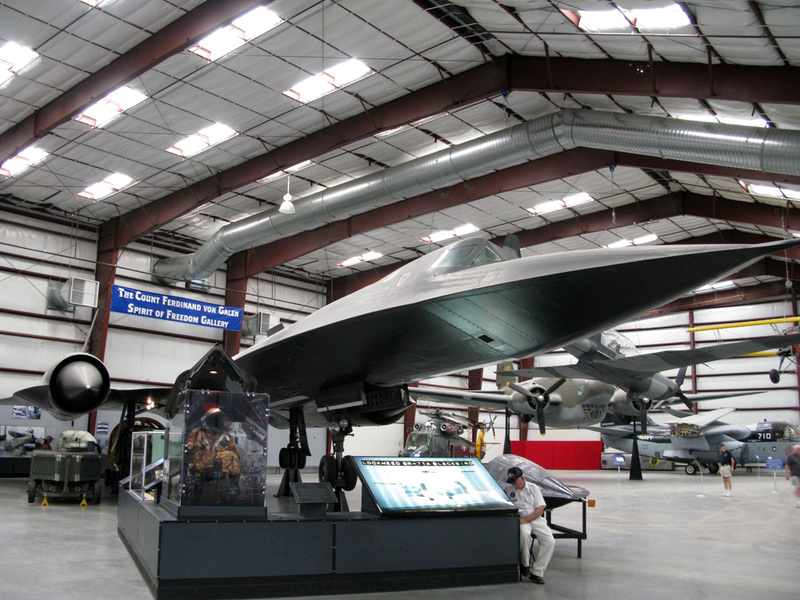 The next day we went to the Pima Air and Space Museum and examined the evolution of civilian and military aircrafts, including the famously stealth Blackbird and a slew of other fighter, cargo and bomber planes now out of commission. We stayed a couple more nights in Tucson, however this time in a friendly, multicultural hostel in downtown Tucson. Not to worry, we were still able to sleep in out roof-top tent, as they let us occupy 2 spots in their small parking lot in the back. For only $20 a night, we had access to all their facilities: showers, kitchen, communal area, wifi, etc., and met some really interesting people. The only downside was that we were right next to train tracks and not too far from the Airforce base – thank goodness for ear plugs. Blackbird at the Pima Air & Space museum. 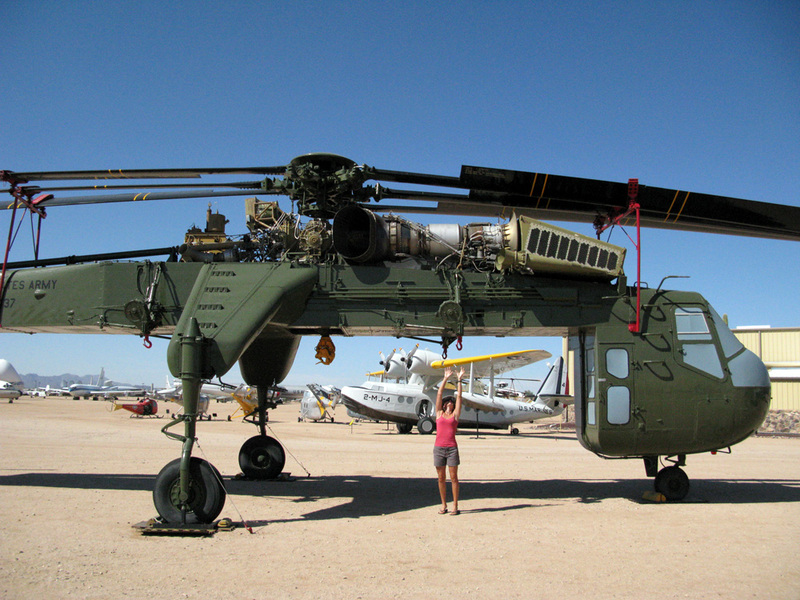 Caro having some fun with the mega lift heli. 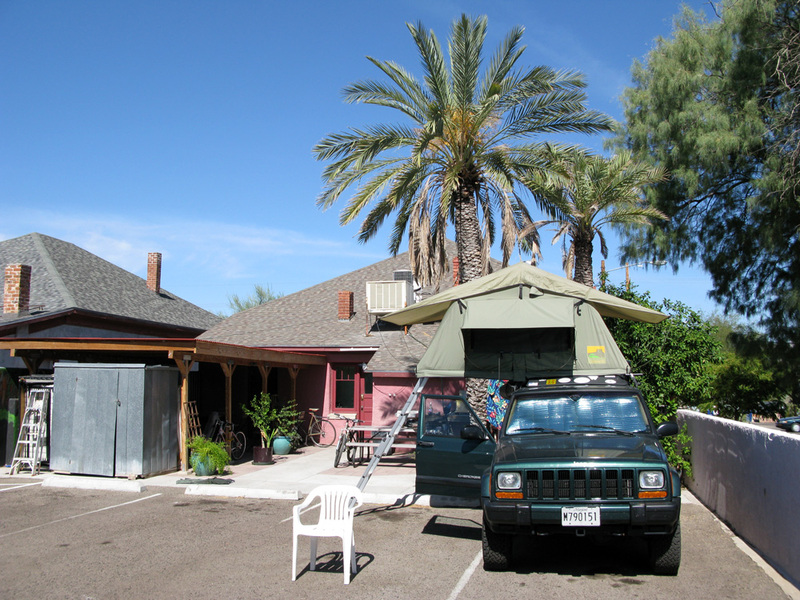 Taking 2 parking spots at the Roadrunner Hostel. 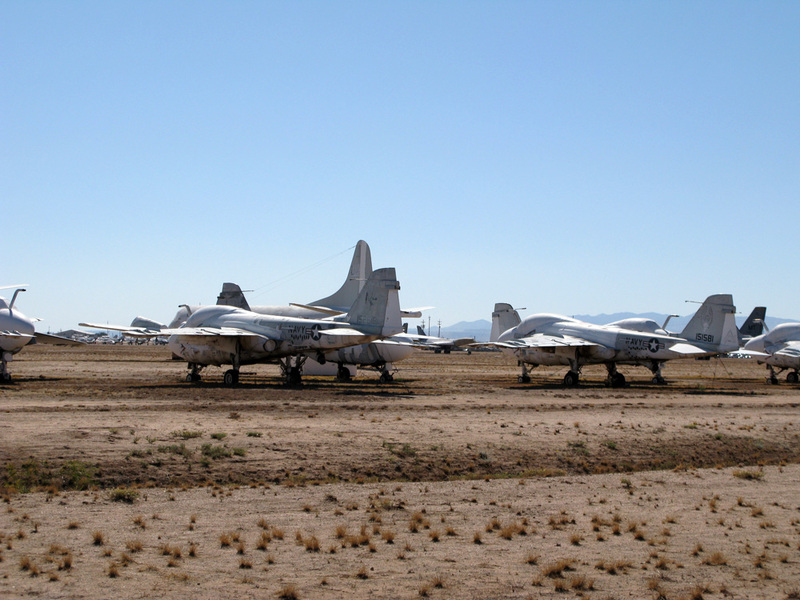 Knowing it was close, we went looking for the Airforce base on our bikes the following day. Despite 20 miles of riding, we didn’t quite make it to the runway, but we did pass a giant solar panel farm in construction and the Airforce “boneyard”. We stayed one last night in Tucson and decided to continue south all the way down to Bisbee, a cute mining town with a many art galleries and a very European feel. We bought a bottle of port wine and cooked a delicious pasta dinner with pesto chicken sausage and portabella mushrooms. Having gone as far south as we could before hitting Mexico, we drove back north again to finish up our loop. Along the way, we stopped at the famous town of Tombstone. Very entertaining indeed – they had a variety of cowboy reenactments on the street. A bit too touristy for us, we decided to move on and get in a last bit of off-roading with the Jeep. 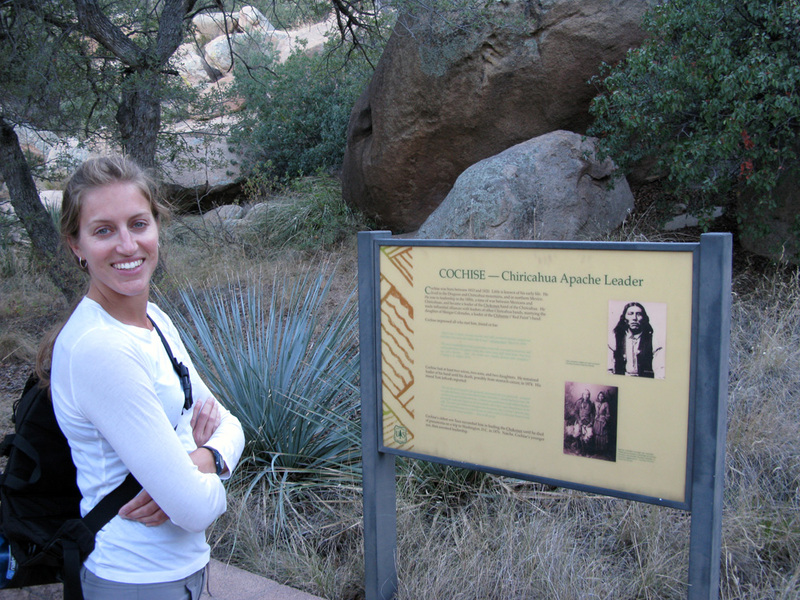 We drove on dirt roads over the Dragoon mountains and settled at the Cochise Stronghold campground – ancient home of the Apache Indians (who raided the settlers in the valley and retreated to these mountains). Ready to eat our measly salad for dinner, we were approached by two women camping nearby who had mistakenly bought too many t-bone steaks and asked if we could please help eat them. We of course readily accepted and joined them for a warm and convivial dinner. Although we had the better sleeping arrangements, they definitely topped us with their camping gear, including a good sized propane oven for baking biscuits! 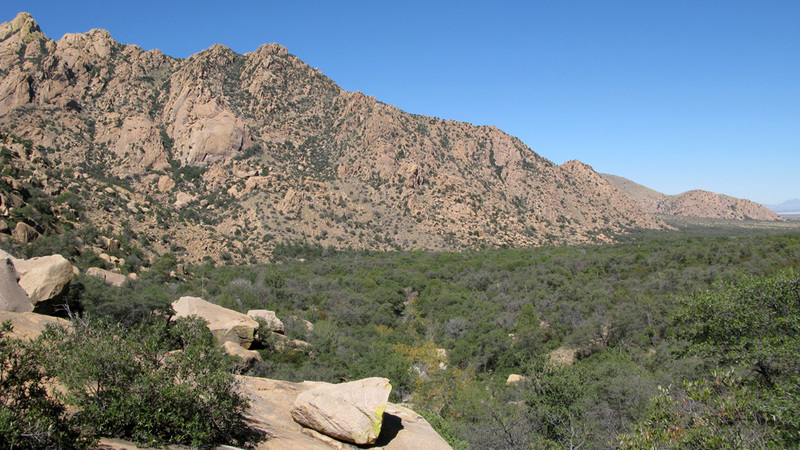 Cochise's stronghold in the Dragoon Mountains. 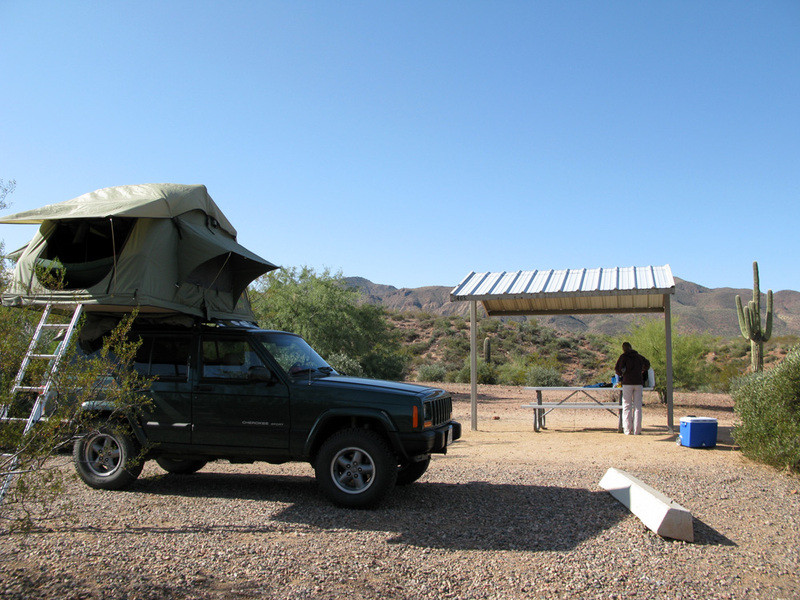 The following day we continued northward back towards Phoenix and settled at our last campsite in the US! We found a great spot on Roosevelt Lake and enjoyed our last nights with the Jeep. Pat went for one last mountain bike ride around the lake before packing up the bikes for good. We set up hammocks and relaxed as we watched an unusual haze creep over us, an anomaly for Arizona. Although we didn’t get a rain storm, we certainly got a wind storm, and spent our last night listening to our tent flapping in the wind. We soon accepted it as music to our ears, as we embraced the warmth and comfort of our humble roof-top home. Our last campsite with the Jeep. We'll miss you! A bit tired but quietly satisfied, we followed our final scenic route back to Phoenix, past familiar saguaros, lichen-scarred rock faces, and countless mesa tops – all treasures of the great Southwest. At the close of 3 months, we feel grateful to have visited such stunning places, learned about the interesting flora and fauna of this spectacular part of the world, all while sharing it with a few friends along the way. We’d like thank John and Julia for taking us into their home, twice, and enabling our journey forward sans Jeep. We hope all of you have enjoyed our diaries to date, and we hope you continue to follow along as we enter the next phase of our trip. We certainly look forward to sharing our stories as we explore the rest of the Americas! Thanks again and we’ll be in touch in Costa Rica! bing! 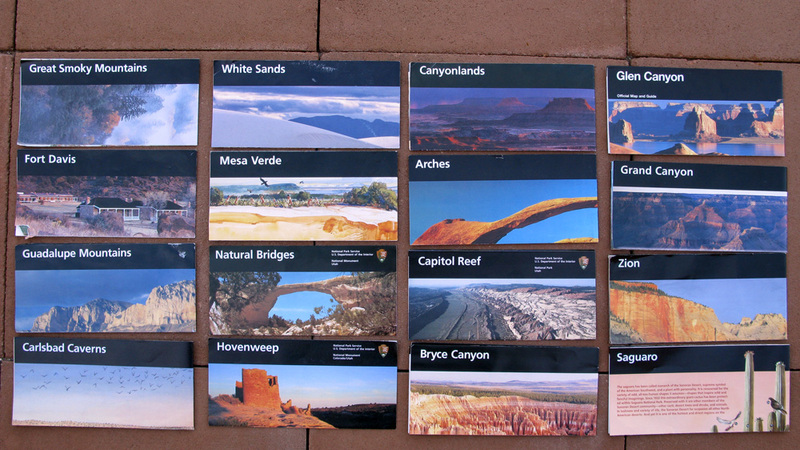 Our National Park map collection, which we're very proud of. Uncle John and Aunt Julia - our fabulous hosts. 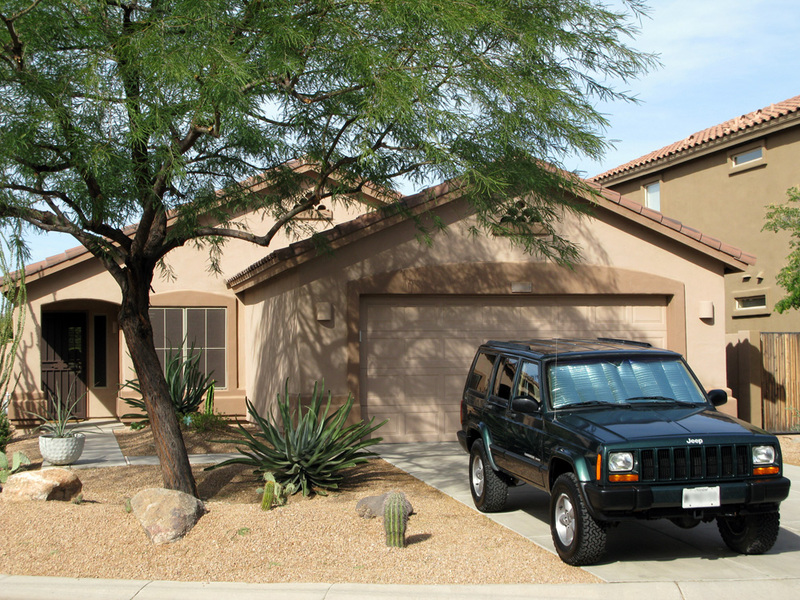 The Jeep's new home in Arizona at John and Julia's. Pat and Caroline, it has been so much fun following your journey across the U.S. We wish you the best as you travel South! Can’t wait to hear about your travels through Central and South America. great entries. have fun in the rica. for some reason i keep imagining you two hot wiring an old beat up airplane to escape from the rebels… caro takes off on a jungle strip and pat lands safely across the border! haha have fun you two! Have fun in Central and South America. I love keeping up with your travels and the great writing is a nice bonus. Pat and Caroline. What a fantastic trip so far. I hope you have a great time in Central and South America. Best of luck!